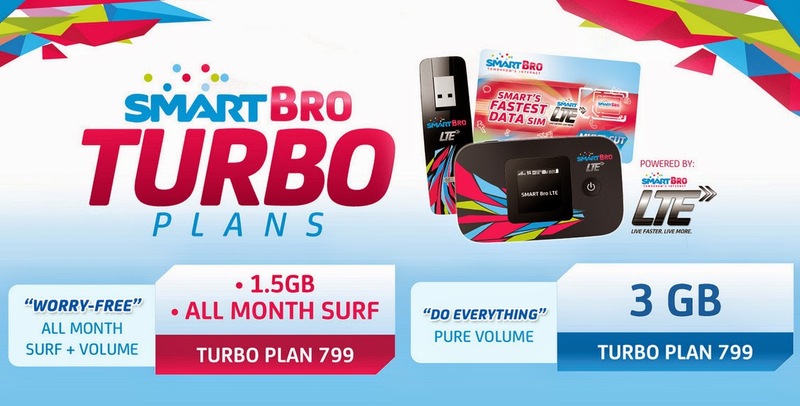 Smart Bro Turbo Plans Details : Pure Volume or All Month Surf, Which Is Right For You? Last December 2014, Smart Communications started to roll out its volume based Smart Bro Turbo Plans, which offer a selection of LTE services based on consumers' internet behavior. They offer a wonderful alternative to 'unlimited' plans for both casual and heavy internet users. I personally think these plans are great because, with them, you only pay for the actual data that you use. If you're just a light net surfer, for example, you could be paying more than what you actually use with an unlimited plan. There are two types of Smart Bro Turbo Plans. We have the 'All-Month' Surf' and the 'Pure Volume'. All Month Surf allows you to do light, casual internet activities (like checking social media accounts on Facebook, Twitter and Instagram, Google search, web browsing, chat and reading e-mails) without using the volume inclusion of the plan. Once you consume the All Month Surf data volume allocation for heavier internet use (including downloads and watching videos), you will experience speeds of up to 256kbps on the light and casual Internet activities. Pure Volume, on the other hand, lets you perform heavier internet activities (including streaming of music and videos, downloading or uploading of files and video clips, etc.) that use the entire volume inclusion of the plan without lowering your speeds. When you’ve used up your volume inclusion, you may purchase additional data packages like Big Bytes volume add-ons that are available via the Bro Dashboard and billed on top of monthly service fee. Both All Month Surf and Pure Volume come with come with free 75 Tri-Net SMS and 30 minutes of Tri-Net Voice Calls. How will you know which Turbo Plan is right for you? For me, if you don't really download large files or watch Youtube videos all that much but you love checking and updating your Facebook, Twitter, and Instagram accounts as well as reading your favorite blogs and websites, All Month Surf will be great for you. But if you're a heavy internet user who demands the fastest speeds at all times while watching and uploading clips and large files, you definitely need Pure Volume. Now, all you have to do is to figure out which volume allocation would be right for you. Don't worry we'll help with you with that in a future TP post.